﻿ Ploen Place Residence, Pattaya | FROM $25 - SAVE ON AGODA! "Friendly staff, easy check in." Have a question for Ploen Place Residence? "Warmly recommended, close to beach and Terminal 2"
"Lots of food shops, shopping malls and convenience shops nearly by." "Pros: Room is spacious with microwave and fridge available." 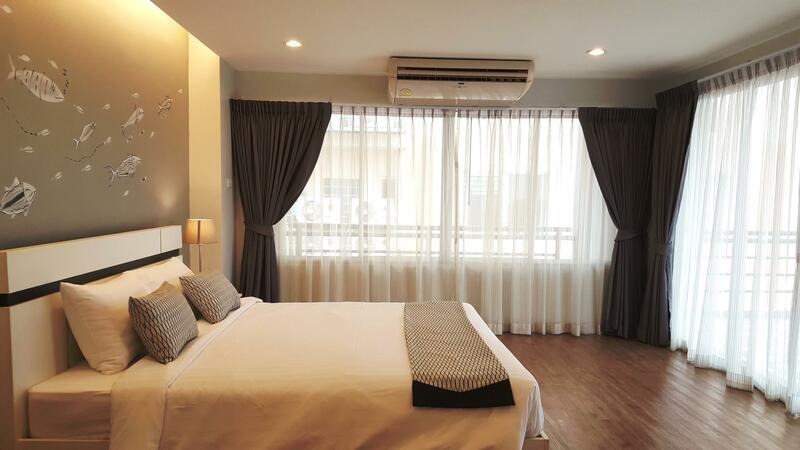 "Clean room with nice location"
Conveniently located in Pattaya, Ploen Place Residence is a great base from which to explore this vibrant city. The hotel lies from the city center and provides accessibility to important town facilities. With its convenient location, the hotel offers easy access to the city's must-see destinations. At Ploen Place Residence, every effort is made to make guests feel comfortable. To do so, the hotel provides the best in services and amenities. The hotel provides free Wi-Fi in all rooms, 24-hour security, daily housekeeping, 24-hour front desk, facilities for disabled guests to ensure our guests the greatest comfort. Guests can choose from 60 rooms, all of which exude an atmosphere of total peace and harmony. The hotel offers an excellent variety of recreational facilities, including garden. Whatever your reason for visiting Pattaya, the Ploen Place Residence is the perfect venue for an exhilarating and exciting break away. "All people working at the hotel are really nice and friendly..."
Pros: Good location, room size and acceptable cleanliness. Very affordable for this size and location. Cons: Very noisy guests in corridor with no control from management. Soap n shampoo provided was miserably small and when we requested for more from the reception she took out a housekeeping chart to prove to us that they've already given us. Of all my years of travelling never had an accommodation denied me extra soap with a chart to show they've given. Also requested for extra toilet rolls as we booked 2 rooms and again only 1 was given. Too stingy on the amenities. This was a huge letdown. Bed was huge but too hard. Gave me backache. Thank you for your comments We will make it better. Pros: location (5 mins walk to Terminal 21), quiet place at nice for peaceful rest. Staffs are very polite n diligent, even the security guards greets me every time i passby them. Room is very clean n spacious. Cons: Aircon is very noisy. Shower area too cramped. Toilet bowl too near to the wall. Newly built hotel, looking and feeling modern. Spacious large rooms, good stable wifi connection and very handy location at the opposite end of Walking St. Gives you access to Central Marina shopping centre across the road, mini Korea Town and Chinatown on the left side. Lots of food and massage places around. For around 1000 baht pn, you can't beat this place. Highly recommended to all of you to staying in this hotel as it is too close to shopping malls, Pattaya beach and a lot of facilities. The hotel area is to quite. Nice big rooms, have balcony, safety box, big bed not to firm. Ac works fine. All people working at the hotel are really nice and friendly. this was a last minute choice since the other hotel reservation got cancelled. The room was OK, staying there for 2 nights. Was rather surprised in a positive way about this place. It’s more are less a newly renovated place. Room is big enough and everything is there what you need. The only negative point is the shower/bathroom which is only cut off with a shower curtain and after taking a shower, the whole bathroom is wet. Anyhow would go back again. Dear guest. Thanks for the comments. If I have to apologize for it. I hope to meet in the next. Great small hotel clean and quiet. The bed was rather hard but a staff member put a nice pad down for me which made it much more comfortable . The staff were very polite and the hotel is clean . The agoda online price was very reasonable. Dear Guest. Thanks for the comments. I hope to meet you again in the next opportunity. Minutes away from the beach, close to shops (Central Marina) and supermarket (Big C). The Baht bus is a few metres from second road and just under 100 metres from Beach road. The hotel is situated down a small soi which is one way only.The entrance is abut of a challenge as it is a very steep incline. The bathroom in the standard room was very small and cramped. Situation was ok but the nearest beach was under reconstruction. Plenty of places to eat and drink, but the seafood was outrageously expensive. And beer prices matched Bangkok in the restaurants. Pros: Room is spacious with microwave and fridge available. There is a sofa in the room and lobby they have washer and dryer. The staff is very good and they try to accommodate your request as much. They have storage facilities for keeping your luggage before check in or after check out. Try to get upper floors to get a nice view of the beach. Cons: Hard to locate the hotel even though they are located close to beach. The bathroom is small. The location is not that great with street too narrow and hard to walk going to beach but nothing to complain as most streets are narrow in Pattaya. They do not have restaurant in the hotel. The cleanliness can be improved would be better. I saw a small dead cockroach next to the cups but the second day of staying was cleaned up. Suggestion: Offering the 2nd roll of toilet paper for guests. Good location Modern style Some would consider maybe slightly on expensive side But no negatives.